When I decided to publicly proclaim that I’m going after this silly dream to be an Ironman, I actually had trouble sleeping that night. What the hell was I thinking? What if I can’t commit to the training? What if I’m not good enough? What if there really is no hope for my swimming? I’m happy to report that I’m sleeping quite well these days, after putting in a couple solid weeks of no-joke TRIATHLON training! This week alone I logged just over 10 hours, which included 31 miles, 3 pool sessions, 2 hours of TOUGH strength training, and 3 sweat-fests on the trainer with my new beloved Felt. I may not be fast, but dammit, I’m dedicated. Since I’m back on a Higdon plan for the Eugene Marathon, I’m trying to work in biking and swimming around that, so that running gets priority. The only mandates I’ve come up with are making sure that marathon-pace and long runs come first in the day if I’m doing something else that particular day as well. Otherwise, I’m just listening to my body, and aiming to be on the bike and in the pool 3 times a week each. I’m not getting too hyped up about time or distance–just focusing on making it happen. Today in the pool I was feeling particularly frustrated with how HARD swimming is for me, when I realized that my first tri (with a swim of 500 yards) is over 3 months away. And then I realized I went from non-runner to half-marathon finisher in just over 3 months. So this is doable. 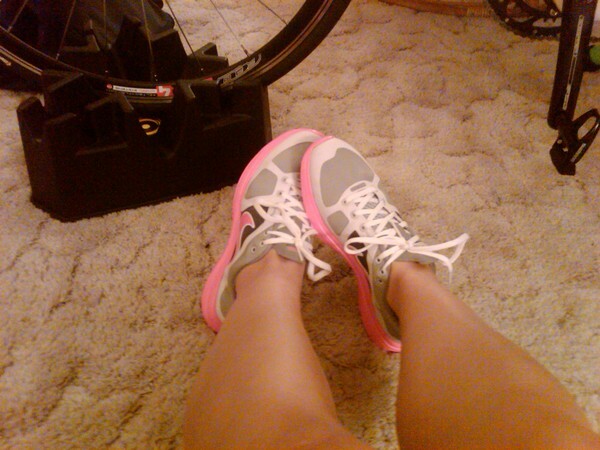 Ooooh and I got a pair of Lunaracers! I have a hookup and our local running store and I was offered a nice little discount on them, so I went for it. I’ve run in them once and liked them, and depending on how icy/snowy it is, I might give them a try at the Frostbite Four next month. Bring me PRs this year Nikes! I’ve never completed a triathlon (my hip acts up after too much cycling), but as a runner and open-water swimming, I share your love of a cross-training-heavy schedule. Whether you’re a fast or slow or in-between swimmer, there’s nothing like a couple laps to work out any post-run kinks! Quite interesting, I was not very rlealy convinced by the inflated water running ball you referred to in a previous post. This looks much more practical, although the price is still quite high. Isn’t it a little too fast to train in an urban environment? Also I was wondering what running equipment you are using at the moment, especially what shoe model.Thanks for answering. I think I probably apoarpch a purist of sorts when it comes to social housing. I am extremely antagonistic towards it. My view is that the state should have no hand in providing housing. The reason I give is that it tends to lead to all the well-known abuses that welfare does generally. Tenants do not respect what is not theirs. The quality and thought that goes into erecting mass ghettoes is often derisory. They lump together too many young, feckless, criminally-minded types in one place. They drive out any respectable, decent people who are viewed as local curiosities. They break up families. They are an aesthetic nightmare typically. So anyone who rejoices in new proposals for social housing is clearly mad in my opinion. I know of several people who have refused to live on Council estates point blank. I can’t blame them. There is a watered-down version of this actually which only strengthens my argument. That of the private, non live-in landlord, with his slew of bedsits. Many such landlords are a smaller scale version of the state. They have their properties (council estate / four bed terrace) but do not of course live there. In fact they never, or rarely visit at all. Rent is paid out of sight, and the tenants’ anti-social behaviours towards his neighbours is a case of out of sight, out of mind for Mr Invisible. If you try to find out who the landlord is, you face a considerable challenge. The Land Registry will report that the owner resides at the property (on a surprising number of queries) which is of course a lie. The Council, protecting Mr Invisible will of course tell you nothing. The same parallels are there to be drawn, only less strong. Everywhere in life there is a strong tendency to dodge responsibility and turn a blind eye to reality.